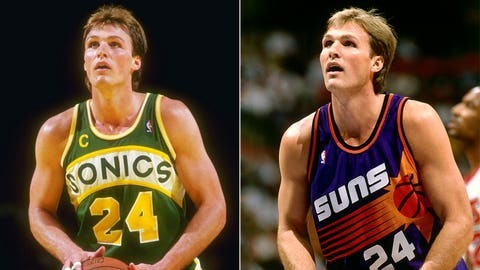 A move from Seattle to Phoenix by Tom Chambers opened a door in the NBA. For more than a week now, the basketball world has waited with bated breath to hear what — or, rather, where — will come next for LeBron James, Carmelo Anthony and the NBA’s most prized free agents. As the league’s top players weigh their options and prepare to hand-pick their next destinations, few fans stop to consider that, as recently as a quarter century ago, even the sport’s brightest stars had little to no say in their own futures. Before the summer of 1988, unrestricted free agency was little more than wishful thinking — and an unrealistic dream at that. Until then, virtually the only way a player could leave the team that drafted him was through a trade, and in the rare instance a player signed on with another team as a free agent, significant compensation was awarded to the player’s previous team in the form of players or draft picks. Following the 1987-88 season, Tom Chambers was emerging as one of the NBA’s top up-and-coming players. The 1987 All-Star Game MVP, Chambers had averaged 20.4 points per game over five seasons with the Seattle SuperSonics after being traded from the San Diego Clippers and had helped lead the team to a berth in the 1987 Western Conference finals. Unfortunately, he was stuck in a loaded frontcourt that included Xavier McDaniel, Derrick McKey and the recently acquired Michael Cage — and one that, unbeknownst to him at the time, would be adding Shawn Kemp in the following draft — leaving him unsure of where he fit in the team’s future plans. It seemed likely Chambers would be retained by the Sonics and then traded at some point down the line because that’s just how things worked. That all changed, however, when players union rep Larry Fleisher came to Chambers’ agent telling him to pump the brakes on an assumed agreement to re-up in Seattle after the team made him a qualifying offer. A short time later, a revision to the collective bargaining agreement was finalized, allowing certain veteran players the right to unrestricted free agency. 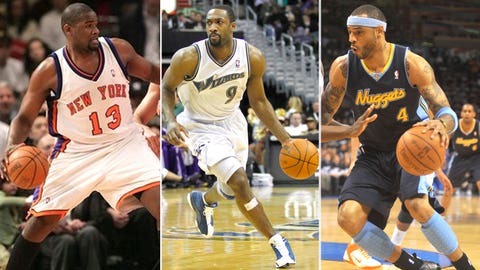 The conditions dictated that a player had to have played through two contracts and at least seven NBA seasons. Chambers met both requirements and would become the test subject for countless free agents to come. Ultimately, Chambers ended up with the Phoenix Suns, where he would make more than double what his previous contract with the Sonics paid: $9 million over five seasons — not exactly LeBron money but great for the time. The choice to leave Seattle wasn’t an easy one, though, and Chambers said he felt guilt about being the league’s first player to willingly leave his old club behind with the team getting nothing in return. Perhaps surprisingly, one thing he didn’t encounter was resentment from other players who were stuck in contracts that wouldn’t give them the freedom to choose a club until much later. Over the next 25 years, of course, Chambers has seen the concept of free agency take on a life of its own. These days, amid the 24-hour news cycle, it’s a circus, with players, who now face even fewer restrictions than they did in Chambers’ time, leveraging the wants of every team in the league while jumping from city to city and teaming up with other superstars on a whim. There’s a thought that James, with his second “Decision” saga, is redefining the very nature of free agency in much the same way Chambers did in 1988, but ultimately, Chambers says, it’s best for the athletes to have LeBron-level control over their situations, with the owners at the mercy of the best players, not the other way around. “It really makes a lot of sense,” Chambers said. “You see teams overpaying for free agents, but they’re not having to give up draft picks or having to give up players. All they have to give up is money, and that’s something that most of the owners have a lot of. Unfortunately, what’s best for the players may not always be best for the fans, who have been forced to grow accustomed to watching superstar players bolt after just a few seasons, particularly in smaller markets offering less glitz and glam for stars to soak in. The fans have been shortchanged in this deal. Still, Chambers says, allowing players to have the choice to be loyal to a franchise is a better option than forcing them to be loyal to the teams that draft them. “I don’t think the balance is out of whack, but it’s nice and refreshing for me as an old-school guy who wanted to play in one place,” Chambers said. “I wanted to stay with the Clippers, and I wanted to stay with Seattle, and I wanted to stay with the Suns, but there are things that happen, and when you’re getting a (bigger) contract offer from another team, you have to take care of your family. And for that, the players all owe a big thank you to Chambers, the guinea pig for free agency and a star who changed the course of the league forever — though he’s a little more modest about his place in NBA history.